If you mention the name “Paul Anderson” in front of a random group of people, most of them will probably think you’re talking about an unremarkable middle manager of a cereal manufacturer. A “Paul Anderson” doesn’t carry the designated weight of an “Arnold Schwarzenegger” or a “Hafthor Bjornsson”, a.k.a. “The Mountain.” After all, a “Paul Anderson” doesn’t have a worldwide strength expo named after him or cause mass mayhem on Game of Thrones. A “Paul Anderson” is just a regular dude. Mention the name “Paul Anderson” in the company of strength professionals, though, and suddenly you’re referring to a genuine hero. With official numbers at a 199.5kg (440lb) clean & jerk, a 420kg (930lb) back squat, and unofficial numbers like a 285kg (628lb) bench press, and a 2,840kg (6,270lb) backlift, Paul Anderson might be among strongest humans in history — and a pioneer in multiple strength sports. The first recorded mention of Paul’s super strength came in a February 1952 issue of Iron Man Magazine. Bob Peeples, a world-renown lifter and writer for the magazine, tells the story of their first meeting. A 19 year old Paul went into Peeple’s weight room, and without any warm up or wraps, squatted 550lbs…in just his regular shoes. 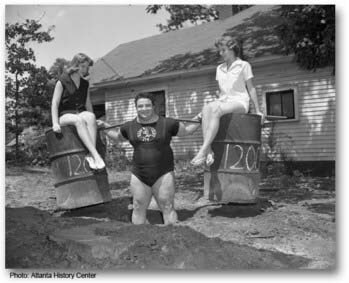 At 5’10” tall, the 275lb teenager with the 50-inch chest had just squatted 25lbs under the standing 575lb world record, and he did it twice. A short time later, at 20 years old, Paul competed in his first strength competition and squatted 605, 635, and the 650lbs — officially breaking a 30 year old squatting world record. He would go on to become one of America’s top competitors in weightlifting, eventually becoming Olympic Champion (more on that below). 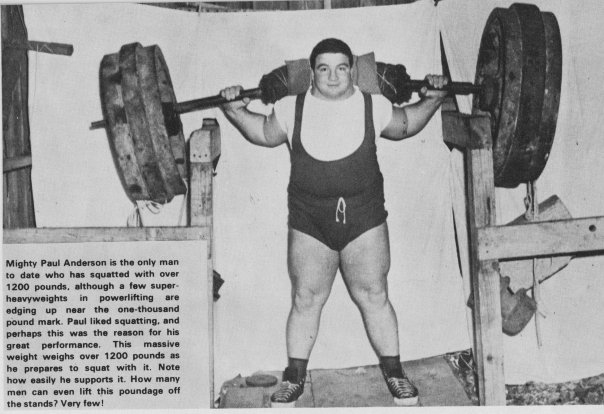 Anderson’s feats of strength continued to span disciplines throughout his career. In 1954, Paul suffered a series of injuries, including a hip injury from pulling a 3500lb safe that had accidentally frozen to the ground. He also broke his wrist during a world record attempt in Indianapolis, and a short time later, suffered multiple broken ribs from a car accident. Paul rebuilt the cast on his arm using steel rods and supports, so as not to hinder his training. As if that wasn’t badass enough, Paul didn’t always have access to traditional weights, so he made his own out of household items like 55 gallon drums filled with concrete, the aforementioned safe, and iron wheels. Paul also developed his own training methods that included squatting all day, every other day. 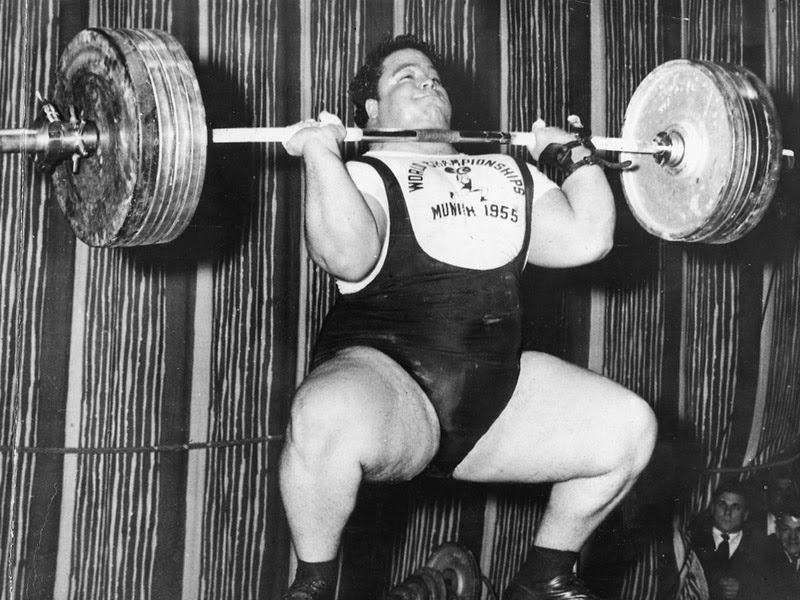 He believed that the squat was the most important lift for building strength, contrary to experts at the time. Anderson’s unconventional training eventually worked its way into strength programs, and techniques such as Anderson Squats are now common practice. In just four years, Paul became a World Champion, Olympic Champion, two time U.S. National Champion, set 18 American Records, and 8 World Records. After reaching an astounding level of amateur success, Paul turned professional in order to use his talents to raise funds to help troubled youth. He relinquished his amateur status in exchange for paid appearances that ultimately supported the Paul Anderson Youth Home, founded by Paul and his wife Glenda in 1961. This decision was particularly notable because it meant Anderson could not compete in the 1960 Olympics, as amateur status was required at the time. The Paul Anderson Youth Home still exists today and continues to follow its mission of working with kids who might otherwise be incarcerated. Paul died on August 15, 1994 from complications from kidney disease at the age of 61.